Lend us a fiver, will you Samsung? 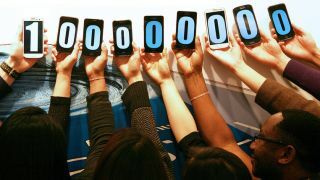 Who'd have thunk that the little Samsung Galaxy S would spawn the mobile juggernaut that is the enduring Galaxy S smartphone range, today gliding past the 100 million sales mark. That's no small amount of phones just two years and seven months after the first Galaxy S shipped. Around 40 million of those 100 million handsets are Samsung Galaxy S2s, the phone that Samsung credits as the "driving force" behind its "rise to the top of the global smartphone market". But the Galaxy S3 is selling more-than-healthily too. It looks set to surpass its predecessor with 40 million units shipped in seven months and averaging 190,000 handset sales a day. It may be champagne and Rolexes all round at Samsung HQ but we can almost hear the sarcastic woop-de-doos emanating from rival camps. Once the great hope of the Android scene, HTC is struggling to get back on track after a trying 2012, while supply woes dog the Google Nexus 4 and reportedly underwhelming iPhone 5 sales as people prove unimpressed by its pitch of being slightly longer but still crucially much the same as the iPhone 4S for quite a lot more money.